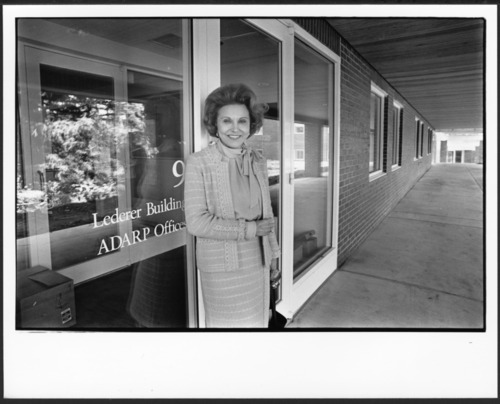 This is a photograph of Eppie Lederer (Ann Landers) at the Menninger Foundation 'West Campus' dedication, June 9, 1982. Eppie Lederer was a trustee of the Menninger Foundation and donated money toward the construction of this building. The building was named for her. In 1925, the Menninger Sanitarium Corporation purchased a farmhouse on the west edge of Topeka, Kansas. The farmhouse became the inpatient clinic and the surrounding 20 acres were developed with buildings and gardens to become the "East Campus" of the Menninger Foundation. In 1982, the "West Campus", a much larger area, was developed west of Topeka. It was a residential scale community of 28 structures on a 350 acre hilltop campus. In 2003, the Menninger Foundation moved to Houston, Texas.